VIVAGLORY Life Jacket showcases a floatable solution to all Water Sport Activities for dogs. 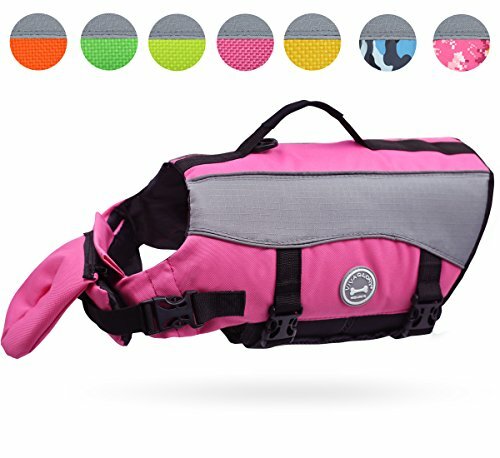 Constructed from the sturdiest materials and the most vibrant colors, the VIVAGLORY Life Jacket is utility and stylish. The design, providing mobility while increasing buoyancy, molds to fit the contours of your dog's body for a snug fit that is adjustable. The durable rescue handle makes it easy to help dogs out of the water in the event of an emergency. Only at VIVAGLORY pet store. 1. How to choose a right size for my dog? Please kindly read the HOW TO MEASURE & SIZE CHART illustration in the product pictures. If further assistance is needed, please contact Vivaglory to get in touch with our professional customer support team who is standing by to work with you in a 24*7 timely fashion. 2. How to let dogs get used to wearing this life jacket in water? Before taking dogs to swim, please let her/him to wear the life jacket on shore. She/he will get used to it after a couple of times' practice. Then, it is time to take her/him to water wearing the life jacket. After another a couple of times' practice, she/he will act like a champion swimmer in water. VIVAGLORY is a trademark that is registered in the United States. Having been in manufacturing pet products for about 10 years, we have our own professional and experienced Research & Development Department. New products with diligent design and superior quality will be released every season periodically for our lovely pets. VIVAGLORY loves pets as so much as you. VIVAGLORY also cares for the comfort, durability and facility to clean of pet products. When buying VIVAGLORY products you will get excellent quality and best customer services. We will bring you more enjoyment and satisfaction of owning the pets.